Angel investors can teach you a lot about what it takes to start a successful business. Whether you're seeking angel investment or just looking to grow a better, stronger business, they're people worth listening to—and here's their best advice for startups. I’ve seen this over and over in my dealings, both as an angel investor on my own and as a member of a local angel investment group. Most angel investors don’t just reject startups—we explain why. And we don’t just say yes either; we explain what else is needed. What we did at the Willamette Angel Conference (from 2009 to 2017) was the rule, not the exception. We took a $100 fee for submissions, and what we offered in return was real feedback. To see what I mean, take a look at the blog posts and videos available at Gust and do a web search for AngelList. Angel investors are individuals willing to invest their own money to fund new startups. Most of them have made money with startups; they’ve been through the wringer, they’ve succeeded, and they are in a position to share. They can teach you a lot. So if you’re a startup, always focus on listening first. One of the most common misunderstandings is the assumption that angel investors invest in startups that will become strong, independent businesses. However, the angel investors don’t make money from their investment until they can sell their ownership for actual real money—that is, until an exit, such as the business being acquired by a larger business, or registering for public stock sales. So, somewhat paradoxically, investing in a startup that becomes a healthy small business, generating its own cash and profits, can be a loss for investors. If that business never gives the investors a way to sell their ownership for actual money, then there is no return. No matter how good your business is, if it doesn’t offer investors cash out at some point, it’s a bad investment. If the investors end up with a minority share in a healthy business, one that never sells out, then they never get their money back. This explains one very important point for your startup: If it has the potential to start, grow, and be healthy without needing outside investment, you could be better off without investors. Keep in mind that when you take investment, you’re giving the investor a part of your business. When they have a stake in your company’s success, they have a vested interest in influencing your day-to-day operations for profitability. Never seek investment when you don’t need it. My personal favorite in the “pure nonsense category” is the IRR, the internal rate of return, something that was interesting for about one hour as part of the MBA curriculum, but which has no relevance in the real world. Combine a wild guess on future growth for several years, add in a wilder guess about future valuation prices and exit opportunities, and then pretend that the combination means something. It really only means that you haven’t recovered from your MBA years. Forget it. You’re out of school now. I have to admit, I’ve seen some judges of graduate-level business plan competitions care about IRR, but never an actual angel investor during actual due diligence. A close second is projecting stupid profitability into the future. Please, get a clue: Real businesses usually turn out net profits in single digits, and only rarely up as high as 20 percent. 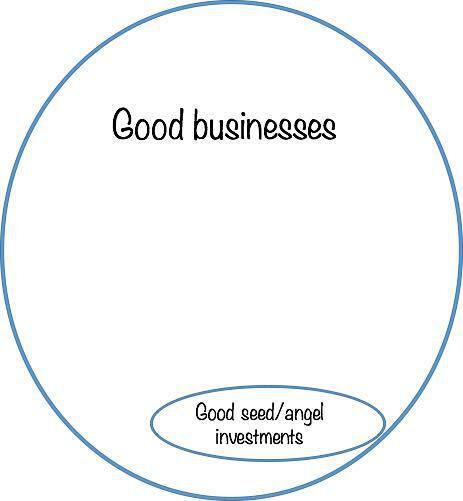 Angel investors are not impressed by projections of 30, 40, 50 percent or more profits on sales. They don’t think that means you’ll be profitable, but rather that you don’t understand what you’ll need to spend. If your sales forecast is reasonable, then you are probably underestimating costs, expenses, or both, in your expense forecast, budget, or projected profit and loss. And it gets worse—a lot of angels, in a lot of tech business markets, prefer high growth and deficit spending to profits. I was told once that my business was too profitable for VC investment. Many investors believe that startups have to choose between profits or growth, and can’t do both at the same time (more on this in lesson 5 below). This is a very important concept: Scalable means a business can ramp up, increase its volume enormously, without increasing its fixed costs proportionately. Can you jump from selling 10 to 100 to 1,000 to 10,000 without a proportional jump in headcount and overhead? Product businesses usually can. Some web service businesses can. But a lot of businesses can’t. This is why investors don’t usually like service businesses. They tend to depend on the people more than the product. Key assets walk out the door every night. They can’t scale up. Investors use the term “body shop” to refer to the many service businesses that depend on people doing specific things for each unit of sales. They will ask “do the assets walk out the door at the end of the working day?” Professional services such as attorneys, accountants, consultants, and design or product development companies are classic body shop businesses that can’t scale. Rand Fishkin’s book, “Lost and Founder,” gives some interesting perspective on a company that transitioned from an unscalable consulting business to a SaaS product. Fishkin is pretty frank about the pros and cons of scaling his business and taking on investors. Angels want you to have some way to defend your business against competition. They’ll talk about whether or not you have a so-called secret sauce that sets you apart from the competition. All that is about defensibility, also called barriers to entry. Sometimes, this discussion is about patents. Patents can protect inventions, formulas, and algorithms. In a perfect world, having patent protection would be a good answer to concerns about defensibility. In the real world, although patents are always an advantage, patents alone aren’t enough. Investors look for what the patents cover and ways competitors will work around them. Not all patents are enforceable and not all patents rule out ways to work around them, getting to the same market without violating the patents. The world of startups is littered with the carcasses of businesses that were protected by patents in theory, but not in fact. Patents require active legal budgets to protect aggressively against infringement. There are other factors that make startups defensible. Trade secrets, effective branding, differentiation, and first-mover advantage can help. What investors will teach you is that you don’t want to identify a great market without having the resources to grow fast and seize market share before others do. Consider this the two sides of a single coin: First, angel investors want companies that grow fast and exit. Second, companies that grow fast are going to present both the need for more investment and the growth potential to justify more investment. Therefore, companies that can fund their own growth are less interesting than companies that need to raise more money later to finance continuing growth. Normally, attractive growth takes investment. It doesn’t fund itself. The scalable defensible company that has a shot at increasing sales 300 percent per year for a few years needs to invest in marketing expenses, working capital, employee ramp-up, product development, infrastructure, and other factors that support that growth. Product companies, for example, need to spend on product development and materials and prototypes before they launch, and they have to buy inventory to build products. Then, if they sell through channels, they have to wait months to get paid by distributors or retailers. All that absorbs cash resources. Web companies, as another example, need to develop the product offering in code, and test, before they launch. If you’re working a startup and dealing with angel investors, it’s not up to them to understand your story and believe in you; it’s up to you to have something they want to invest in. And, don’t expect angels to give uniform advice. I’ve seen many times how a startup pitching a focused targeted ramp-up strategy, using a narrow market as a beachhead, will be told by angels that it’s too narrow—so the entrepreneurs change the pitch to go all the way to the huge market instead, to get turned down as “too broad,” or “too many moving parts.” Angels don’t do that on purpose to drive you crazy; they’ll have different opinions. And one final word: If you pitch repeatedly for angels and nobody is interested, get a clue. You might not have a good investment to offer. Revise your business plan, do something else, or maybe you have one of those good businesses that isn’t a good investment. The only general rule? There are no general rules.